Regionalism is not the only determinant of economic development. Many other international economic variables could also affect economic development. Globalization is one of them.1 There have been pros and cons of the role of globalization in enhancing economic growth and/or quality of life. Stiglitz (2003) was critical of globalization, as it has deepened global inequality between the haves and have-nots, especially in the less developed countries. Goklany (2007) argued for a positive effect of economic globalization based on free trade, and demonstrated that the free trade helped to enhance the human well-being. Foreign direct investment (FDI), a cross-border investment, is undeniably an important ingredient of economic globalization. Multinational corporations (MNCs) are international ‘carriers’ of the FDI. The role of MNCs in economic development in host countries, developing or developed, has nevertheless been controversial (Nunnenkamp and Spatz 2003). Russet (2005) found that democracies are considered efficient in generating wealth and economic growth, which also lessen the frequency of internal conflicts. The authoritarian political systems turn out to be more conflict-ridden than democratic counterparts and they lower the quality of life. The authoritarian political systems are unable to effectively manage external debt and foreign assistance as well. Many developing countries have implemented liberal economic reforms in recent decades. They have been successful in economic growth (e.g., Chile, Brazil, etc. ), yet there are still many other developing countries that remain poor and have not experienced any significant economic growth. While political liberalizations and reforms, with minimal corruption, are required for sustainable economic growth, China and Singapore, for example, with their respective ‘authoritarian capitalism’ have documented a rapid economic growth without undertaking significant political liberalization. South Korea was able to rapidly develop in the 1970s and 80s while its political system still remained authoritarian. A huge military spending disproportionate to the economic capacity is siphoning off the resources, which otherwise could have been used for economic growth and improvement of the quality of life (Sivard 1991). Some found the interaction between the defense spending and economic growth. Benoit (1978), basing on data on the 44 developing countries, argued that there is a positive correlation between military expenditures and economic growth over the period from 1950 to 1965. Klare (1987) demonstrates that every additional dollar spent on defense in developing countries reduces domestic investment by 25 cents and agricultural output by 20 cents. Their findings supporting the trade-offs were based on the Cold War period. Defense spending was still found to have a significant effect on the level of quality of life during the post-Cold war era. Countries with greater defense burden retain a lower quality of life regardless of population growth, urbanization and ethnic diversity (Kim 1996). Ethnic heterogeneity has been impeding the enhancement of quality of life (Collier 1999; 2007). Empirical evidences have shown that demographic variables such as ethnic composition (Alesina et al. 2003), urbanization (Todaro and Stephen 2009: 320–359) and population growth (McNicoll 1995) have significant effects on quality of life. What affects economic development is not only domestic but also international. In our study we will employ ‘multiple’ variables, domestic and international, including the regionalism. In order to identify an independent (i.e., a ‘pure’) effect of regionalism on economic development, all other international and domestic variables assumed to affect economic development will be also controlled. SCO (Shanghai Cooperation Organization: 6 countries) / Central Asian region. Globalization: it is based on the KOF Index of Globalization, which measures the three (‘plural’) dimensions of globalization: economic, social, and political (see Note 1 for the detailed measures of globalization). Terms of trade: the measure is based on the index of the price of a country's exports (benefits) in terms of its imports (costs). Debt sustainability: it is measured by per capita amount of external (foreign) debt divided by per capita amount of export. The large ratio means a weak sustainability, while the low ratio means a strong sustainability. Ethnic homogeneity: it is measured by percentage of the dominant ethnic-racial groups within each nation. Urbanization: the measure is based on urban-rural dichotomy; ‘urban’ refers to a group of allegedly nonagricultural pursuits while ‘rural’ to agriculturally oriented employment. Population growth: the natural increase per 1,000 of the population, based on the difference between birth and death rates of respective population. Types of political system: countries are classified as ‘not free’, ‘partly free’, and ‘free’ in terms of the degree of political freedom represented by both political rights and civil liberties. Countries with ‘not free’ were coded as 1 (highly authoritarian), ‘partly free’ as 2 (authoritarian), and ‘free’ as 3 (democratic). Military expenditure: the measure is based on military expenditure as a percentage of GDP. The data on two hundred and seventeen (217) countries are used in this analysis. The data cover the period from 2005 to 2011 depending on their availability for each and every of the countries. This study, for that matter, is not amenable to a time-series analysis but to a cross-national comparative analysis. A multiple regression analysis is used. The multiple regressions will test whether the regionalism affects economic development regardless of other international economic and domestic variables. 1 The globalization based on the KOF globalization index was used in this analysis. The KOF Index of Globalization was introduced in 2002. The KOF Index of Globalization measures the three main dimensions of globalization: economic, social and political. KOF index of globalization is released annually by the KOF Swiss Economic Institute (Dreher, Gaston, and Martens). 2 The term Washington Consensus (1989) refers to market-friendly policies, which were generally advised and implemented both for advanced and emerging economies. It is also used to refer to economic reforms that were prescribed just for developing countries. In November 2010, the G20 group of governments agreed on a ‘new’ Seoul Development Consensus. The Seoul Development Consensus for Shared Growth is a set of principles and guidelines set up to assist the G20 nations and other global actors in working collaboratively with less developed countries in order to boost their economic growth and to achieve the UN's Millennium Development Goals (MDGs). 3 It is very important to take into account at this point that the author speaks here about the disappearance of a significant impact of regional organizations of the first type in their mathematical model and not in reality. In no way this statement should be understood as claiming that such an impact existed sometime ago and later it disappeared. – Editors. 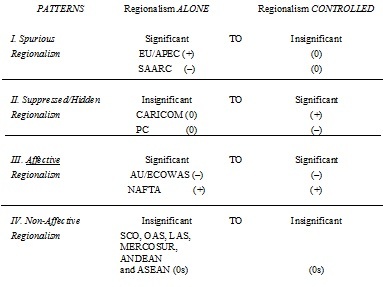 4 Note that the author considers the regional organizations as units of his analysis. It is quite clear that if he studied, for example, the impact of the joining the European Union by individual countries on the economic development of particular countries, he would discover that this impact in many cases is rather significant. At such a level of analysis one would have to take into account many other factors not considered by the author – for example, the requirements that regional organizations impose on new members with respect to particular social, economic, and institutional indicators. – Editors. Abbot, K., and Snidal, D.
1998. Why States Act through Formal International Organizations. Journal of Conflict Resolution 42(1): 3–32. Alesina, A., Devleeschauwer, A., Easterly, W., Kurlat, S., and Wacziarg, R.
2003. Fractionalization. Journal of Economic Growth 8: 155–194. Appleyard, D. R., Field, A. J., Jr., and Cobb, S. L.
2006. International Economics. 5th ed. New York: McGraw-Hill/Irwin. 1978. Growth and Defense Spending in Developing Countries. Economic Development and Cultural Change 26: 271–280. 2007. Smart Samaritans: Is There a Third Way in the Development Debate? Foreign Affairs 86: 132–140. 1987. Causality between Exports Growth and Industrial Development: Empirical Evidence from the NICs. Journal of Development Economics 26: 55–63. 2007, 2008, 2009, 2010, 2011. World Factbook. Washington, D.C.: Central Intelligence Agency. 1999. The Political Economy of Ethnicity. In Pleskovic, B., and Stiglitz, J. (eds. ), Annual World Bank Conference on Development Economics (pp. 387–399). Washington, D.C.: World Bank Publications. 2007. The Bottom Billion: Why the Poorest Countries are Failing and What Can be Done about It. New York: Oxford University Press. Finnemore, M., and Sikkink, K.
2001. Taking Stock: The Constructivist Research Program in International Relations and Comparative Politics. Annual Review of Political Sciences 4: 391–416. 2007. The Improving State of the World: Why We're Living Longer, Healthier, More Comfortable Lives on a Cleaner Planet. Washington, D.C.: Cato Institute. Karns, M. P., and Mingst, K. A. 2010. International Organizations: The Politics and Processes of Global Governance. 2nd ed. Boulder, CO: Lynne Rienner Publishers. 1996. Trade-Offs between Military Spending, Quality of Life and Economic Growth. Comparative Economic Studies 38(4): 69–84. 1987. The Arms Trade: Changing Patterns in the 1980s. Third World Quarterly 9: 1257–1281. 2004. External Debt Sustainability: Guidelines for Low- and Middle-Income Countries. G-24 Discussion Paper 26. Geneva: UN Conference on Trade and Development. 1995. Effects of Population Growth: Visions and Revisions. Population and Development Review 21: 307–340. 2003. The Case against a New International Environmental Organization. Global Governance 9(3): 367–384. Nunnenkamp, P., and Spatz, J. 2003. Foreign Direct Investment and Economic Growth in Developing Countries: How Relevant are Host-country and Industry Characteristics? Kiel Working Papers 1176. Kiel: Institute for World Economics. 2005. Bushwhacking the Democratic Peace. International Studies Perspective 6(4): 395–408. 1991. World Military and Social Expenditures. Washington, D.C.: World Priorities. 2003. Globalization and Its Discontents. New York: Norton. Todaro, M. P., and Stephen, C. S.
2009. Economic Development. Boston: Pearson/Addison Wesley. 2000. Governance, Good Governance, and Global, Governance: Conceptual and Actual Challenges. Third World Quarterly 21(5): 795–814.